How Does Google Ads Work For Service Based Businesses? The aim of this page is to give you a clear understanding of how Google Ads work. We’ll do this by explaining why certain elements to digital marketing are important and the implications. Clients that are open to learn about Google Ads are more likely to get more confident about their digital marketing. You can start learning about Google Ads by selecting the tabs. We have placed the content in the order we feel is best to understand how all the products / websites / Google Analytics / and Google Ads link together. Who Can Play The Better Game? In Poker, there are rules to be followed. There are Excellent Players & Poor Players and the House. The House takes a cut, the Excellent Players win and the Poor Players lose money. Google Ads is very similar to Poker. Google is the House and the players are the Advertisers. You’ll get Excellent Advertisers and Poor Advertisers. Whoever can play the better game against the competitors and with the correct resource can now have a chance on Google Ads but all the factors have to be “right”. Spending lots of money without a clear plan, skills, great website etc means you’re not playing a good game. At Click Metrics know what “levers” to pull and how to access the outcome with a decision making process. So how does Google Ads work? When you type a search query into Google, you will usually see ad results at to top of the page. Usually they will have a tiny box next to it (top left hand side) that says “Ad”. This is Google Ads (formally known as Adwords). Businesses pay to be at the top of Google because they realise the value it can generate for their business. The image below shows the results for “maidstone plumbers”. Companies advertise and pay Google to appear right at the top because they know it will generate targeted clicks to their website for whoever needs a plumber. The Google Ads take up the top section (first 3 results, sometimes 4), then the Google Maps, then the SEO listings, also known as natural / organic listings, then 3 more paid at the bottom of the page. Would you like to get your business shown in these positions and gain customers through this method? Here are the components of an ad which can be written to talk to a user that is searching in Google for a maidstone plumber. Notice how all the elements of the ad is used to make the advert larger. Even though there is an ad at position 1, advert 2 stands out a lot more and is more likely to get the click. This can be done for your business. You can have an ad that is large that will draw in the clicks with these elements. We can use words to pre qualify in the head line such as “Projects from £5,000” to avoid low budget customer clicks. Question: How would you want your ads to talk to a customer? What Does Google Ads Cost? What Does Google Ads Costs? Well question will be split in two parts, the first part is the cost of each click and the second part is the overall budget needed for a campaign. We’ll only cover the first part in this tab. The answer to the question of cost is…we don’t know. Until we do the research using the tools provided by Google, we’ll be guessing. 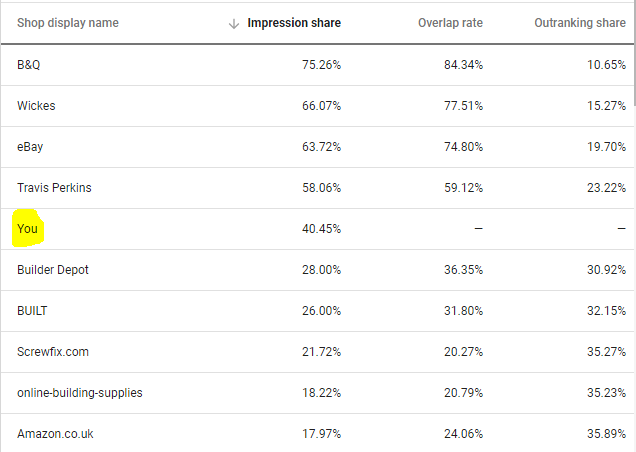 Google Ads costs vary by industry. Some markets the cost per click or CPC can be as low as £0.05 and some markets as high as £50 a click and more. It just depends what market you’re in and the going rate. What we can do is research and find out what it’s going to cost by finding the cost of each click in Google Ads. 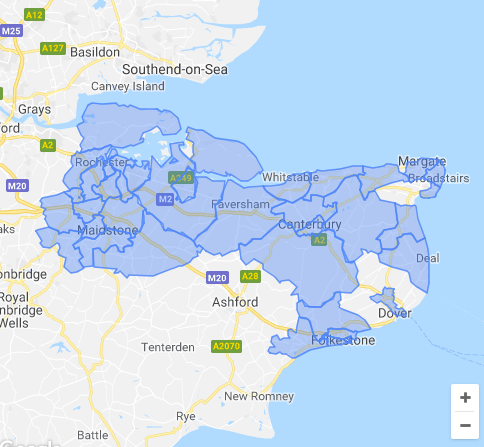 The keyword “emergency plumber maidstone” is searched 70 times per month and cost £2.85 on the low side (meaning a very low position in Google, less chance of getting a click) and £10.34 for the top positions with a high chance of a click. Research your own market and find out the cost per click with your search terms. By finding out the cost per click for a keyword, we can now model the type of budget that might be used to give Google Ads a go. In the next tab, we talk about the second part of of costs, which is the recommended budget. Generally speaking, you need enough budget to give you a sizeable amount of data before you make any decisions. If you were targeting nationwide, you might test with a budget that allows for 5,000 clicks over a period. If your market is local, you might test for 500 clicks. There is no right or wrong answer but generally, the more clicks you get the better the chance to “read” the data. In our experience we generally test 250-300 clicks (phase 1) before we make our next move. Bear in mind, if the keywords are not correct, then you would have wasted clicks. Literally every options, setting, targeting has to be at optimum level before even doing the first “test” campaign. Using the “maidstone plumbers” example of £2.85 and £10.34 a click. We can now model a budget to be put aside for Google Ads. To model for 250 clicks (assuming the right / targeted keyword) we’ll need a budget of £2.85 x 250 clicks = £712.50. For 300 clicks its £855. When it gets to £10.34 per click (ie the advertiser wants to be number 1) you’ll need a budget of £2,585. Bear in mind, these are just Google’s suggestions and in most cases, you won’t pay that amount. You can control what you want to pay for the click (Google decides if it want’s to show you). You’re bids can be a max of £5 a click. When bids are high, it usually relative to the job value when a customer is gained. This will give you the first phase budget. 250-300 clicks for any starting campaign (assuming the right foundations, your Google Ads consultant, keywords etc) will give you a good “feel” for the campaign and to make the next move. All of this doesn’t matter unless you have conversion tracking in place. So why is conversion tracking important? Well if you’re not tracking it or don’t know how to, you won’t know how efficient your campaign is. Conversion tracking is the practice of measuring results in a meaningful which has a real impact on the business. It’s NOT enough anymore to look at the amount clicks Google Ads sent. You want to be looking at the amount of sales / phone calls that was resulted from Google Ads. This is when your paid search marketing becomes real because its actually quantifying in clear numbers. What does it cost my buisness to bring in a phone call? What am I prepared to pay to bring in a new customer / phone enquiry or an email enquiry? You should be able to view in your Google Ads admin and know the costs of a lead, conversion, sale etc. You should see a similar table below. The data below shows that its costing £11.89 to bring in one enquiry for the clients business and they had 48 conversions in that 2 month period for the top campaign. Until you know what it cost to bring in a phone call, you won’t know what you’re willing to spend. When you start knowing these numbers, it allows you to model how the business can grow. Bear in mind, there are so many elements that will affect the conversion numbers such as the website look, the offer on the website, the keyword used, the cost of each click, the position of the click etc so the topic of conversion is about about knowing numbers clearly. The topic of conversion tracking is about being ABLE to measure numbers regardless of how good or bad the numbers are. We’ll talk about what is good or bad in a later tab. In the next section we talk about the type of conversions that can be measured. In this section we’re going to talk about contact form tracking. When done correctly, you can track when a customer fills in a contact form on your website. The easiest way to do this is to add tracking code to the “thank you page” when someone fills in the form. The form redirects the user to the thank you page. In the next section, we show how phone calls are tracked. Phone number tracking is the most interesting because there are many different ways a phone number can be triggered that is associated with Google Ads. The best way to demonstrate phone tracking is via mobile phone device. 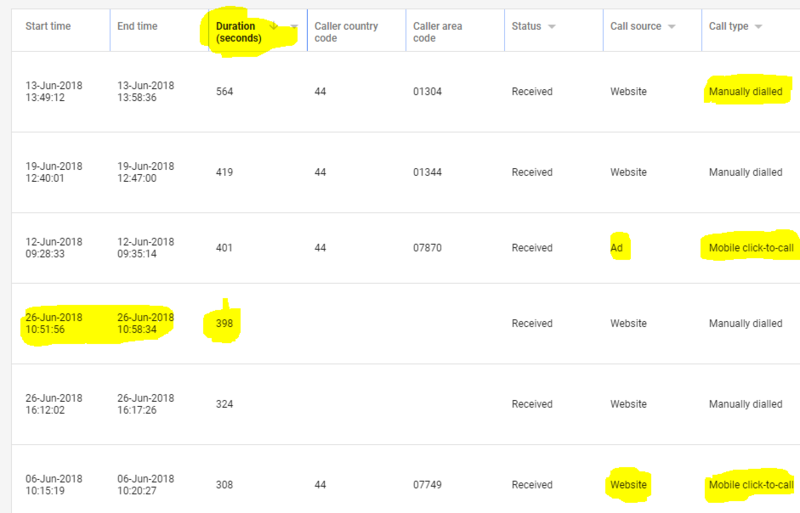 Google forwarding number – We can insert code on the website to change the phone number on your website to a Google forwarding number whenever a Google Ads is clicked on. 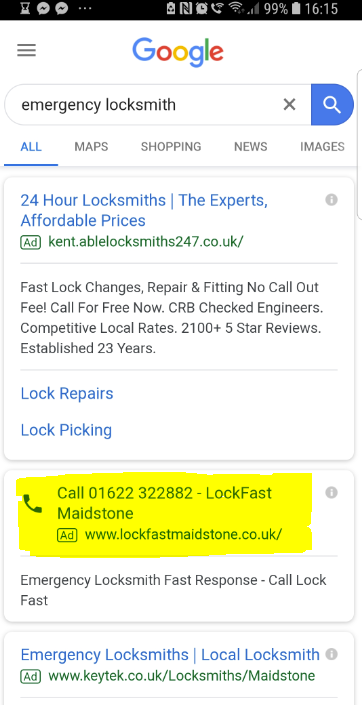 Call extensions – We can add a phone number to the Google Ad and the customer has the option to visit the website or just make the phone call right from the ad. When clicked on, the phone dialer will activate. Google now records that as a conversion depending on how long the call lasted. You might use 60 seconds as a conversion. In this ad, the customer can click the website link and the phone number, see yellow highlight. Call Only Ads – The customer has only 1 option which is to call the company. The company name is shown and what the ads is about, but the purpose of this ad to is get the customer to phone direct from their mobile phone. See the phone symbol where it’s closest to the headline of the ad. You can’t visit the website on this ad. To track the phone calls, you can see when the customer called up, what time, and the duration found. It gives you the call area code but not the full number, which type of call ad (whether it was on the website or straight from call ads). This means 1 lead is generated in 10 clicks. What do you think your website converts at? If you’re not sure, how many visits did your website get last month compared to the phone calls / enquires you received. You can then work out your website conversion rate. 10% website conversion is a good figure to start with. Let’s take £2.85 a click for the plumbing market. Each lead will cost the business £28.50 each. (We can only hope each lead is of good quality, so maybe bid for “emergency maidstone plumbers” around Maidstone to increase the chances of a quality lead). So already it’s costing the business £280.50 to get 10 leads on 10% website conversion. The next question is, if all the leads were of good quality, how many leads out of the 10 will convert into customers? Seeing as this is an emergency call, 6 out of 10, it means it costed you £46.75 to bring in one new customer. What are the profit values for a new customers? Let’s say the average deal size is £90 call out. Minus the cost of Adwords £46.75 leaves you with a profit of £43.25. Let’s not forget that out of the 6 emergency call outs, there might be 1 or 2 larger jobs so now the deal size has increased. The above is the formula we use to “plug in” figures to model scenarios on cold website leads where users will be getting other quotes. You can model your own numbers. You NEED a model to view the numbers in a probability and mathematical way, to give life to your Google Ads campaign. For our other service based business customers, we convert them 15-25% from website to lead. Modelling is absolutely important because it gives life to the campaign and to see scenarios. Business owners who invest in Google Ads should see it as testing your way to success. Test quick to find out what doesn’t work. Google Ads is primarily keyword driven when it comes to Google searches. 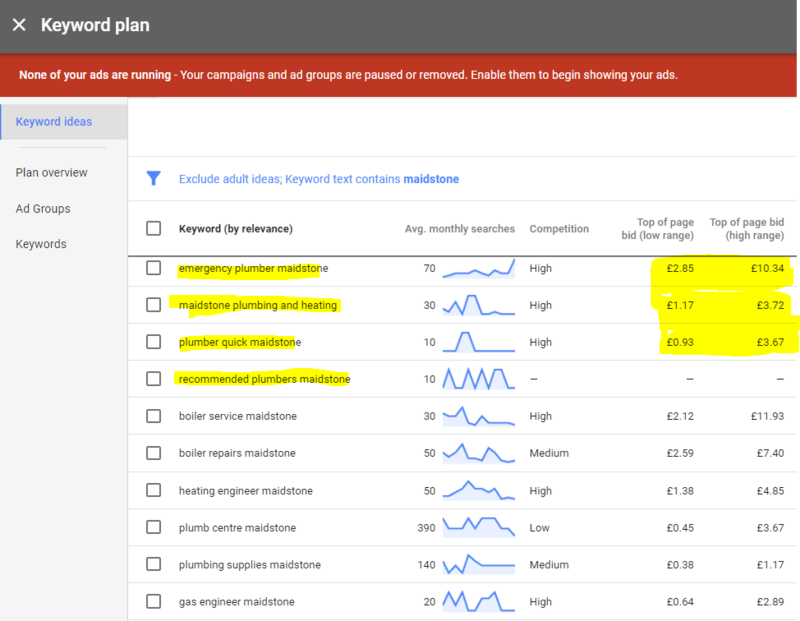 The most important thing when running a Google Ads campaign is does the keyword you’re using have the right intention for your goals? Most companies we work with, they’re driven by hot leads and immediate sales. This means you need to use keywords that reflect the type of customer you’re looking for and the type of interaction you want the website to do. We must understand or at least try to understand what the person is thinking when they’re using keywords. Let’s take the plumbers keywords. Let’s put out a selection of plumbing related keywords and lets try to understand their meaning for a plumbing service business. If you were in a the plumbing business and served customers, you would most likely want your ads to appear for keywords 3, 4 and to a lesser extent number 2. For keyword two, you would qualify the customer in the headline to say you help with plumbing issues to repel non related clicks even though its in the plumbing niche. The great thing about Google Ads, is you can be very precise where you want your ads to appear. When we talk about area and distance targeting, we can target via post codes and also via radius targeting from a specific post code. If you run a local business and you want to attract customers in your area, then radius and area targeting is the way to go. You don’t want to be attracting customers from far away. This option is one of the most powerful settings to be used in Google Ads. This setting doesn’t just related to physical word searches on Google. You could also run display banner ads using the Google network and place banner ads on website if the user is located in your desired location. The location settings and option is that powerful. Not even SEO work could do that well. Question – What area do you want to be targeting? What radius of customers do you want attract? There are a couple of ways you can monitor the competition. You can do a basic Google search and see what competitors come up but you can also see how you compare when you’re bidding against your competitors. The screen shot below shows “YOU” which is the clients details. It means they are showing 40.45% of the time for elible searches. They have 4 competitors ahead of them which are gaining more clicks than this client (major brands). The following allows us to see whose behind or in front of us. By using the information below, we can decide if we want to compete or stay consistent. The aim eventually is to be the top shop name in the list to show for ALL eligible impressions. Question – Do you know if your competitors appear more than you? If yes, do you want to compete and get ahead of them? Maybe you’re confused, “What is keyword match types?” Let me explain what this means. The NUMBER 1 reason why users fail with Google Adwords Search is that they use Broad Match keywords right from the get go, meaning they apply broad match settings (by default) and not even know it. They don’t understand what it means. For most businesses broad match settings is probably the last setting to explore once you’ve gotten ROI from the other 3 settings. Google Ads doesn’t work for all industries but if an industry is paying a very high cost per click then it means that Google Ads is working for them. What this means is that Google Ads is not the problem. If the Ads don’t work for a website, the business/website IS the problem, not the Ads. Here at Click Metrics, we ONLY work with commercial intention keywords because we focus on people that are ready to buy. We can agree a keywords that has commercial intention. If that person doesn’t convert on the website, the keyword is not the problem, the website is. At Click Metrics, we can “mark off” all the factors to why the Google Ads side is NOT working but after that has been tweaked, the focus now would be on the website to do the final “lift”. It comes to a point that Google Ads is no longer the problem and maybe the website or the business is. Google doesn’t promise to solve your business lead generation problems. All it promises to do is send the right targeted click as guided by the practitioner. Google is a connector of people and businesses but you need a bit of skill to use the Ads platform to its full potential. Our job for both of us, is to find out if Google Ads can work for your business very quickly.